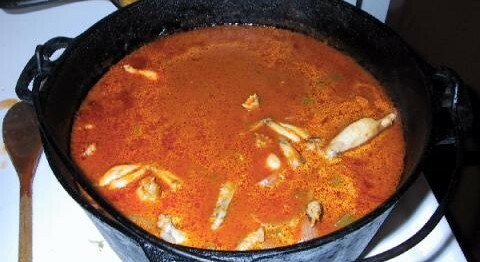 In this dish most Cajuns use the head and body for the sauce piquant and save the legs for frying. Most people think frogs taste like chicken, I say it tastes even better. Speaking of which, if you like, you can use chicken or catfish instead of frog. Both are totally wonderful in this dish. In a large saucepan over medium high heat, combine the oil and 2 tablespoons of flour to make a roux. Stir constantly until the roux is a light to medium brown (about 15 minutes). Stir in the butter and add the onion, celery, green pepper and garlic and sauté for 5 minutes or until soft. Add the tomato paste and cook over medium heat for about 10 minutes, stirring frequently. Add the tomatoes with the liquid, chicken broth, Tabasco, Worcestershire and black pepper. Cover and simmer over low for 45 minutes. Meanwhile dust the frog legs with the remaining 2 tablespoons of flour seasoned with a small amount of salt and cayenne pepper. Coat a large skillet with non-stick cooking spray or a small amount of oil, add the frog legs and sauté until lightly brown (about 3 minutes on each side). Add the legs to the sauce and simmer for an additional 15 minutes if frog legs and 30 if using the rest of the meat. Serve over rice. If using cut up chicken, sauté the meat 5 to 10 minutes longer until nearly cooked through, and simmer for 25 minutes. If using catfish, add directly to the sauce and simmer for 20 minutes. If using fresh sausage brown the sausage and add the sausage to the mixture. Cook an additional 30 minutes stirring to prevent sticking. Add additional water if the sauce thickens.